Perfect location for family and couples alike, this beautiful bungalow home overlooking Wellers Bay offers amazing sunsets and a sandy beach. 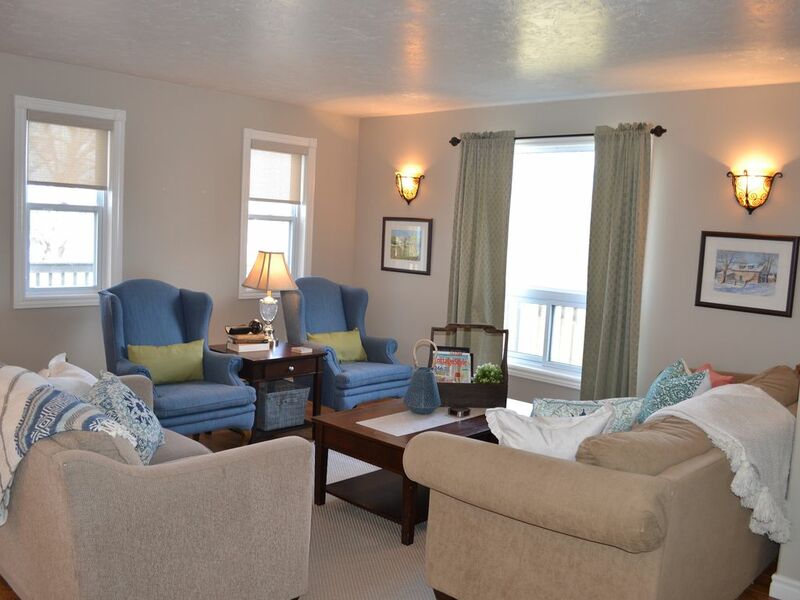 Close to North Beach, Presqu'ile, Sandbanks Provincial Parks and located on the Arts Trail. Enjoy the many wineries, artisan shops and culinary delights that await you in Prince Edward County. This home offers all the amenities of home including dishwasher, laundry and Bell Express-vu. There are two bedrooms on the main level with the living and dining areas and on the lower level another bedroom and family room for relaxing. The cottage is also outfitted with gear for children , there is a crib, change table, bouncy chair, playyard, toddler seat and many toys that you are welcome to use. The owners are happy to share more details on wineries and restaurants to visit in the area. Large kitchen includes breakfast bar, fridge, stove, dishwasher and microwave. Family room with TV, DVD player, Xbox and games plus many board games. The cottage is located on Weller's Bay just outside the village of Consecon, Ontario. The waterfront is sandy beach with very gradual slope that is great for children to run and play in the water. Great property, super clean, kids and dog friendly. Very quiet and friendly neighbors. The house is facing lake Ontario (great view of sunset), the private beach is really nice for kids. Great location, near Sandbanks and Northbeach provincial Park and many winery. Nice quiet and safe place with kids! The owners were very accommodating, instructions were clear and they left some good tips for things to do locally. Cottage was clean and well stocked. Great place to use as a base to explore Prince Edward County while close to Trenton for shopping etc. A very comfortable and well appointed cottage. The cottage is clean and well appointed. The beds are comfortable and the kitchen has everything needed, including plenty of storage space. The high water levels of Lake Ontario resulted in it being not pleasant entering the water on site. Thank you for the kind words about our cottage. You are right, this is a unique year with the extremely high water levels and our beach is under water at the moment. Everyone on our bay and Lake Ontario is unfortunately experiencing the same thing this year. Once the water levels recede we expect our nice sandy beach to be back again.